And That's Not Due To Drink Either! 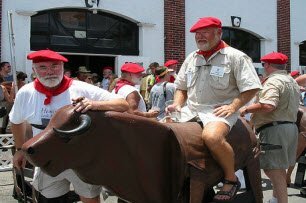 From the bizarre and sometimes ludicrously bad Hemingway lookalike competition, to the Running of the Bulls weirdness, you really have to take a look at the going ons in one of the most famous of the Special Events that occur in the Florida Keys. Each year on the legendary author’s birthday gangs of bearded men converge from across the globe to Sloppy Joes. Of course we call them gangs they might be flocks for all we know. What is the collective noun of up to 150 bearded men anyway??? Even though Ernest Hemingway's home is a famous Key West attraction he only lived in the Key’s for about a decade. It was the fact that he was so prolific in his writing, and his fishing, drinking and socialising which has led to his iconic status in the southernmost island of Key West. These events include not only the lookalike contest, but also consist of readings and book signings, the zany "Running of the Bulls" a three-day marlin tournament and a lot of drinking and laughing. Now you may not have heard of the Running of the Bulls in Key West (it's certainly less famous than the Pamplona version that brings visitors and attendees to Spain each year). Key Wests version is certainly a lot less pacey and dangerous, and consists of all the Hemingway lookalike contestants taking a slow amble around the block on a wooden bull that rolls nicely on four wheels. 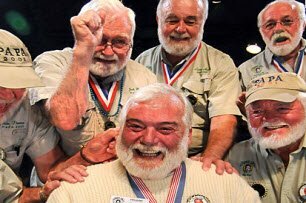 Many of the Hemingway guys appear year after year and enjoy it madly. But I suppose looking like they do, and making the effort to look like the main man would lead you to do the same I suppose.